Stress and Anxiety is one of those by-products of Dyspraxia. Stress and anxiety are not limited to just those with Dyspraxia; in fact, it’s something very common that most people will have contact with in one way or another. Much like other of my extra pages, this one is dedicated to something that isn’t limited to just people with Dyspraxia so the information is universal. With Dyspraxia, these things occur more easily and frequently though. When it comes to having Dyspraxia anxiety is one of the biggest problems we have to face. Everyone deals with stress/anxiety differently and everyone’s anxiety will take different forms depending on the environment and situation. On this page I have put together how anxiety occurs, symptoms to look out for, and how to deal with it. Panic Attack: Are not triggered by a stress factor, but the individual is struck with a feeling of terror or fear that is both unprovoked and unpredictable. There are many ways that stress occurs. Sometimes it can be a single thing that causes it, but it can be a mixture of different reasons. Sometimes they can be linked, so instead of having one thing to stress out about you have a dozen. For example, if you’re being made redundant from a job that alone can cause stress, but then you may stress out over supporting yourself or your family, paying bills etc. Stress can then lead to anxiety and then onto an anxiety attack. If you’re able to identify what’s causing the stress it’s easier to deal with it before it gets unmanageable. Being unhappy in place of work, school, home etc. Trouble sleeping – Waking up frequently or irregularly, not able to get back to sleep or sleep at all, etc. Suffering from sleep paralysis (See next chapter). Personally, I love this one, because for starters it helps identify the problem, and also it gets it off your chest. It can help clear your mind and lead the way to a cure. Many times I have just typed away whatever I am feeling, and it does make me feel better. While a slice of my thoughts get shared on my blog, publishing your thoughts or letting others see what you’ve written isn’t important. Talking with someone you trust (Family member, friend, health expert) to get it off your chest can make you feel better and the person can help you identify the problem, help solve the problem, or just help you through it (even if it’s just reassurance all the time). While a distraction is good at putting you in a better frame of mind it isn’t a substitute for a solution. If there’s a problem that needs sorting it is best to sort it as soon as you can. Don’t feel bad that you need to take a step away either, we all need time to re-energise ourselves. Having a good nights rest can really help prevent stress or coping with it. Settling down at a consistent time every night will help you get a decent nights rest. Also using an electronic gadget such as phone, tablet, computer, etc is not good for a good nights sleep. Some modern devices come with a ‘night-mode’ which dulls the intensity of the screen to help you settle down (some can do it automatically on a timer, so in case you’re like me and you keep forgetting!). It’s best to put the device down an hour or so at least before going to bed. Reading before bed/playing music can certainly help settle you down too. By controlling breathing and relaxing deeply can help deal with current stress, create a chilled out distraction, and help to prevent anxiety or an anxiety attack from occurring. The causes are different, but the symptoms are the same. The sense of impending doom, danger, or dread. Close your eyes and/or cover ears. These attacks can be brought on by too much stimulation to the brain, so reducing as many stimulations as possible will help. 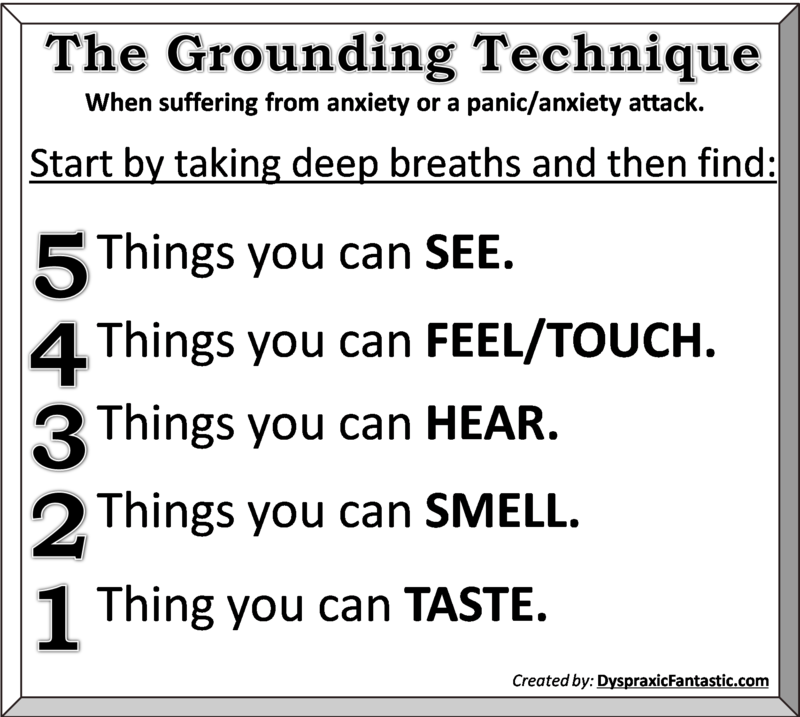 Grounding technique: Find 5 things you can see, 4 things you can touch, 3 things you can hear, 2 things you can taste, and 1 thing you can smell. This is a really useful one and many people do find it is very effective. Relaxation/Deep meditation – Along with the controlled breathing, consciously relaxing each muscle will help. There are videos on the internet that can help with deep relaxation. If a panic attack occurs or anxiety attacks keep happening frequently then it’s recommended to see a doctor. This was something I used to suffer with on a regular basis as a child and on a rare occurrence as an adult. About once every 3 years on average. So “what is it?” some of you may well be asking yourselves. Well, it’s a situation that happens either before you fall asleep or just as you wake up. What happens is your body becomes completely frozen and you’re unable to move, then, in many cases, you start hallucinating. This can take any form imaginable such as shadows, ghosts, animals, aliens, dinosaurs, etc. However, it looks and feels real. Along with this is an over the top feeling of peril, even if there are no visions. It is so convincing that most people who have been abducted by aliens from their bedroom, or seen ghosts of their relatives, for an example, were suffering from sleep paralysis. One major problem is my parents passed it off as just a bad dream. Maybe others can relate, but let me put this as clearly and as bluntly as possible – Sleep Paralysis is one of the scariest and horrifying experiences to witness, it is much more than just a ‘dream’. From suffering from it for many years I know the warning signs, I get a throbbing feeling at the back of my head (that I can ‘hear’) this gets more intense and spreads down my body. If I sit up or move my body it stops the sleep paralysis from happening. This is obviously going to be different for everyone, I expect other people won’t have a window of opportunity or get warning signs. Another warning sign for me was they would always happen after a nightmare or bad dream so after waking up from one I knew it was going to happen. While I have lost movement of my body I can still work my eyes and so closing them stops the visions. The throbbing and feeling of peril remain, but at least it’s more reassuring. The next step is to keep calm, control breathing and keep reminding yourself it’s not real and finally you’ll be able to snap out of it. Sleep Paralysis doesn’t last too long and can you can just ride it out or just try to enjoy the free horror movie. The Sciency Bit: The reason why this happens in the first place is due to the REM (Rapid Eye Movement) state of sleep, which is the deepest part of a sleep pattern, and this is when you typically dream. During this time the brain turns off the movement to your entire body to stop you ‘acting’ out your dreams in your sleep. (For some people this doesn’t happen, which is why sleep-walking can occur in those people). Now, for the sleep paralysis part, this is when the brain makes a ‘mistake’ and turns off body movement while you’re still conscious and then goes into ‘dream mode’. Before I wrap this page up I want to bring up the topic of suicide. Suicide is a long-term solution to a short-term problem and so it doesn’t solve anything and even if it did it’ll only create new problems. Sometimes in life, stress, anxiety, and depression can put you in a completely negative or sad mindset, so much so that you feel like ending it all, and I’ve been in that boat a fair few times. The thoughts can get overwhelming at times. People at the Dyspraxia Foundation are there to assist and so if you have any problems then get in touch and they can either help you directly or point you in a direction to get the right support.